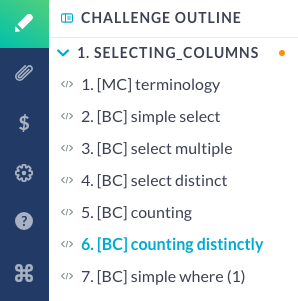 Learn about the MultipleChoiceChallenge exercises used in DataCamp practice. A MultipleChoiceChallenge presents the learner with a statement or question and some possible answers to chose from. When to use a MultipleChoiceChallenge? MultipleChoiceChallenges are the ideal format to test the understanding of concepts and theory. 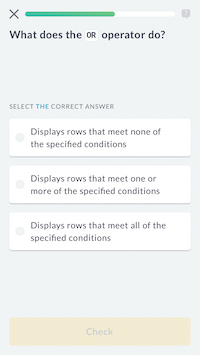 Remember that DataCamp's philosophy is Learn by doing; therefore, we encourage you to test the learner's understanding of theoretic concepts using specific use cases! This section describes the syntax to write a MultipleChoiceChallenge in the Teach editor. To learn about using DataCamp's Teach editor to create practice content, take a look at this article. Each exercise starts with an informative title. This title is for internal use only: the learner will not see it. Setting an informative title will help you and us to navigate the exercises your create. To identify MultipleChoiceChallenges directly from the navigation bar, we use the following naming convention: [MC] your title , where [MC] indicates that this is a MultipleChoiceChallenge. A MultipleChoiceChallenge consist of one or more assignment-options pairs. As you might have guessed, the assignment block contains a question, while the corresponding options block contains the possible answers to that question. In the options block, you indicate the correct answers by enclosing them between square brackets ([ ] ). In addition, you should provide at least one incorrect answer. The order in which you present the options is not relevant: the backend will randomize the options when creating the exercise. The challenge backend will randomly select up to 3 incorrect options to present to the learner along with 1 correct option. Notice that you can use markdown both in the assignment and options blocks. In the example presented here, we're dealing with code syntax, so we're using ` (back-ticks) in the assignment block. We prefer to limit the number of MultipleChoiceChallenge to no more than 25% of one Practice pool. This ensures learners do most of their learning by doing in our coding exercises. Now that you've seen the details of creating a MultipleChoiceChallenge, take another look at the examples provided at the beginning of this document. Do you see how the described syntax leads to the multiple choice challenge? 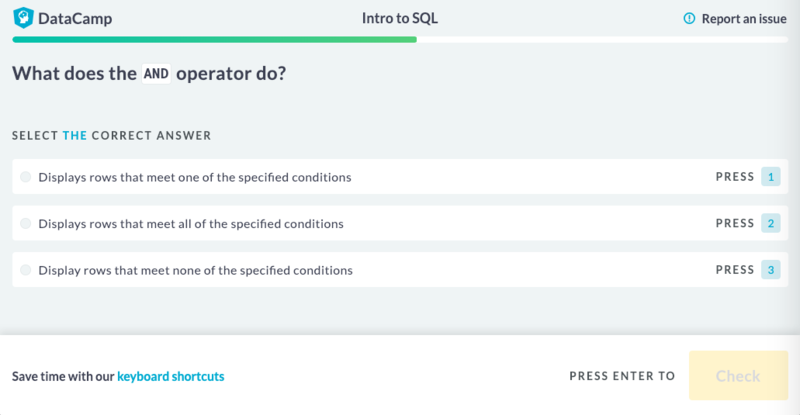 Now it's your turn: head over to the Teach editor and make some challenging MultipleChoiceChallenges for your Practice pool!